(Manchester) If you were looking for drama you were at the right place (Manchester-Essex High School) on Saturday night. The Massachusetts High School Drama Festival was held there. 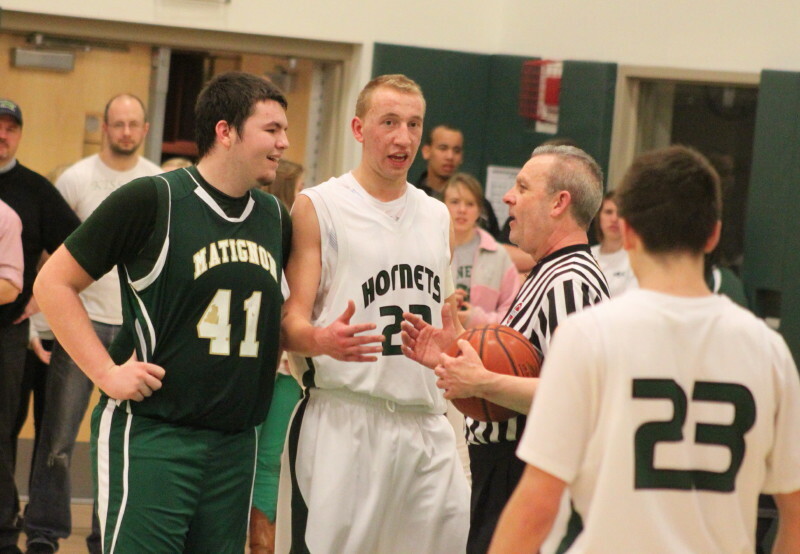 For those of us in the packed gymnasium there was little, if any, drama as the Hornets had everything working and routed Matignon, 93-48, in the D4 North quarter finals. The Hornets are now three wins away from winning the state Division 4 title. Remember that there are only D4 tournaments in the North and South. The upper three divisions have a Central and a West also, so they play more games to sort their champion out. M-E’s North semi-final opponent is St. Mary’s of Lynn. 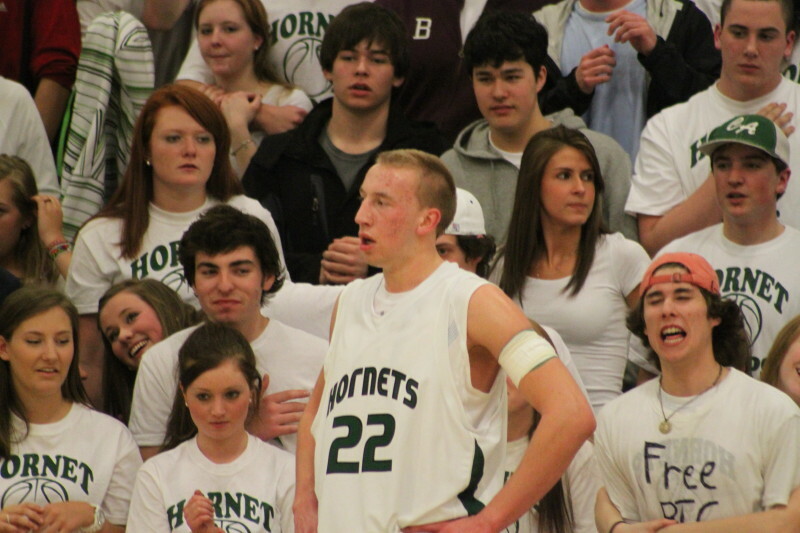 The Hornets have played them twice, losing at home in December and winning at St. Mary’s on February 14th. Also still alive are Georgetown and Winthrop. 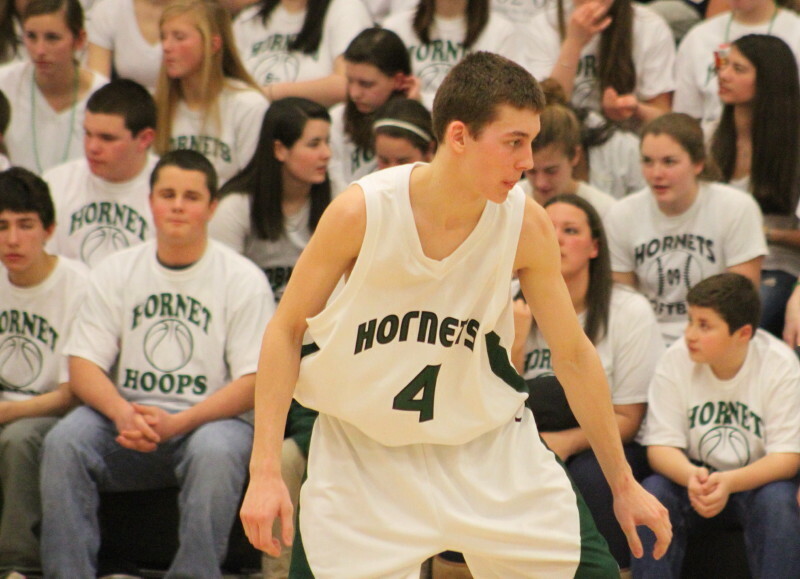 The Hornets split with G’town during the Cape Ann League season. M-E (17-4) led undramatically in this one from beginning to end and how fitting it was that Chris Bishop (34 points) should score first (on a layup). 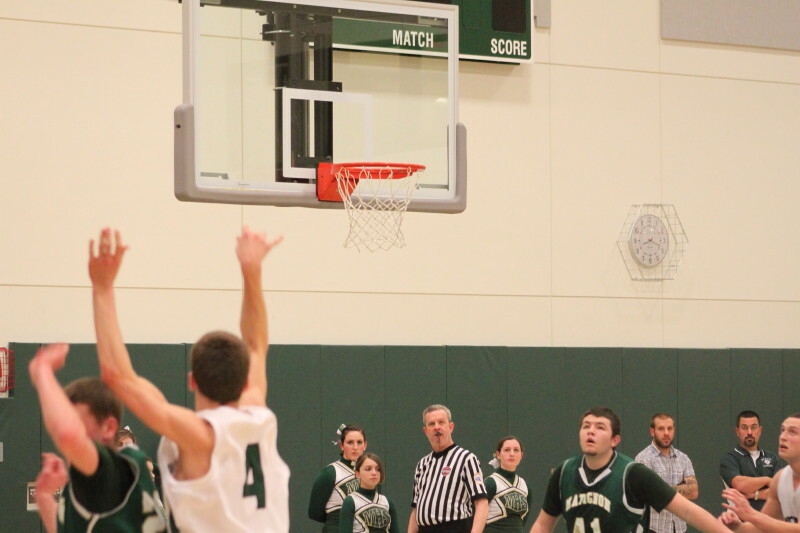 The 6’1” junior had a career night burying six three’s in 2 ½ quarters of playing time. 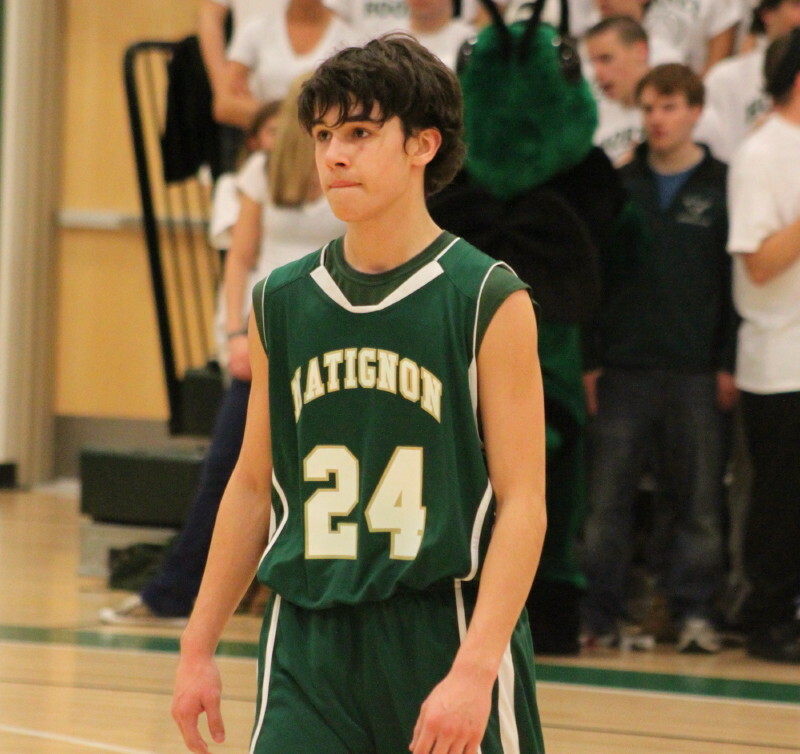 Matignon played a lot of zone defense and their fear of Joe Mussachia (and his 24.7 scoring average) led to abundant open looks for everyone else. On this night Chris took full advantage. By the time Chris scored his last points, the Hornets had a 67-33 advantage and there still were 1 ½ quarters to play. Matignon (14-7) trailed just 19-13 after a quarter and certainly promising for them was the fact that Joe Mussachia had already picked up two fouls. Even with Joe on the pines at the start of the second quarter M-E started to do everything right and the Warriors could do nothing to stop them. The Hornets pressure continually and the Warriors had eleven turnovers in the second quarter. They were actually only able to get off seven shots and connected only once. Down the other end, M-E missed its first seven shots and then went 11-for-18 rolling up an amazing thirty-three points. Chris had seventeen of the points. And if you really want to talk about great offense – the Hornets tallied twenty-seven points in their last eleven possessions. I guess you could say they had it going! The lead was 52-25 at the half and I doubt that any in the sweltering crowd gave Matignon a chance for a comeback in the second half. The Hornets were just too good on both ends of the court on this day. M-E led, 78-40, after three periods. Ron Slager was held to six points after getting 22 in the Warriors win in the first round. He had Chris Bishop defending him for some of the time. 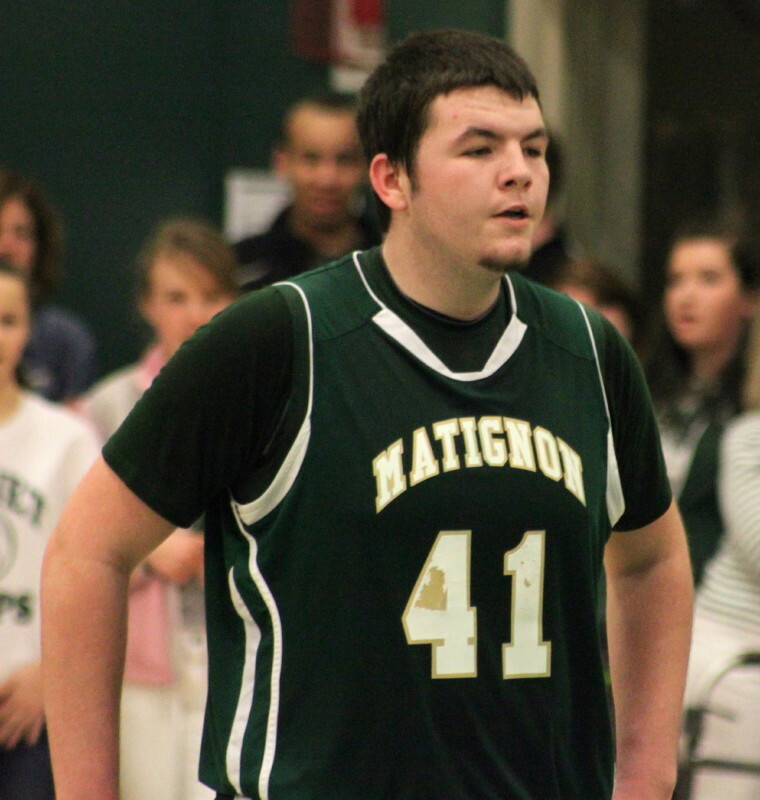 Junior Bob Crane led Matignon scorers with twenty points. His life became a whole lot easier when his defender (Joe Mussachia) picked up his second foul in the first quarter. Amherst-bound Joe ended up with thirteen points in limited minutes. I don’t have his rebound or assist totals but I’d guess he was close to a triple/double. He may have assisted on all of Chris Bishop’s three’s. Joe Burgess came off the bench and tallied ten points. The student section was decked in white shirts. They all filed out before the game was over and then rushed back onto the court to congratulate the players when the game ended. It was my first time seeing the indoor part of the M-E facility. The lighting was excellent as well as the seating. However, there seemed to be no way to vent the heat that the crowd created. I’ve put on a few pounds this winter so sweating was actually a positive! Bob Crane and Joe Mussachia share a light moment with an official.